Once again, for those who find that smartphone navigation just won't get you there, Garmin dedicated GPS auto navigation systems are the best you can buy. Our report names the best models for all needs and budgets -- from bare bones to loaded to the max with bells and whistles. Striking the best balance between value, features and performance, the Garmin DriveSmart 51 LMT-S offers what most people want in a car GPS -- without breaking the bank on too many fancy extras. Its 5-inch color touch screen, voice command compatibility, multi-touch display, traffic data via your smartphone and free lifetime map updates all help you navigate, and Garmin's driver alerts (warnings for upcoming sharp curves, speed changes, school zones and more) boost safety. If you are tired of squinting to see your GPS display, the giant 6.95-inch screen on the Garmin DriveSmart 61 LMT-S is a refreshing alternative. It's easy to type on and read, especially if you've got bad eyesight or a big vehicle. This auto GPS system comes loaded with every feature found in the top-rated Garmin DriveSmart 51 LMT-S (including voice commands and Garmin's driver alerts). Despite its relatively low price, the Garmin Drive 51 LMT-S has the important features experts say you really need. Navigation is quick and accurate. It has a 5-inch touch screen, speaks directions aloud (with landmarks), and the lane-assist feature holds your hand through tricky interchanges. Traffic data is available through your smartphone, too, though some extras, such as voice commands and a multi-touch display, are missing. What's the best way to navigate? Car GPS (Global Positioning System) receivers are designed for in-car navigation. You can spend anywhere from $100 to more than $300 on an auto GPS navigator -- and they'll all get you from point A to point B reliably. Pricey models add some useful extras. For example, you can get an auto GPS system that understands voice commands (so you never have to take your hands off the wheel) and boasts larger screen sizes, up to 7 inches, so there's no more squinting to see routing. Some models include extras that, while also useful, have little to do with navigation -- for example lane departure warning systems and dash cameras. Garmin's newest models, the Garmin Speak and Garmin Speak Plus (both of which are covered below), have Amazon Alexa built in, so you can tell Alexa to turn down your house's thermostat, reorder toothpaste, etc. while you're driving. Those little luxuries can make getting from place to place less stressful -- but they'll cost you. At the lower end of the price spectrum you get a car GPS with few niceties, not even traffic information in the least-expensive options, but one that can still help you reliably find your way. But if you've got a smartphone with a free navigation app, do you really need a separate GPS navigator at all? Should you skip the GPS unit and just navigate with your smartphone? Work without a data signal. Smartphone navigation used to conk out every time you lost your data signal. But now, many apps can work offline. That means you can always navigate with your smartphone, even if you lose your signal (or don't have a data plan at all). Automatically reroute if you take a wrong turn. Speak loudly and clearly. Standalone car GPS units have good speakers. So do most smartphones, and if your car is Bluetooth compatible, your smartphone and navigation app can speak through your car's speakers instead. Understand voice commands, so you don't have to type. However, voice recognition is often omitted in lower priced car GPS units. Provide lane guidance, telling you which lane you'll need to be in at an upcoming intersection. Detect traffic snarls and route you around them -- as long as you are in an area where traffic information is available. Again, some cheaper stand-alone GPS systems lack traffic capability altogether. Automatically dim the screen (or switch into night view) when it gets dark to make it easier to view. Navigate walking, bike and public transit routes. Battery life. Navigating can quickly drain your smartphone's battery. No phone interruptions. If you answer a phone call while navigating with your smartphone, your GPS session will minimize or pause. To call it back up while talking, you'll have to tap around on your phone -- hardly safe (and in many areas, illegal) to do while driving. One-box solution. Car GPS units come with a windshield/dashboard mount and cigarette-lighter power cable. If you want these items to use with your smartphone or mini-tablet, you'll need to buy them separately. Easy -- no tech know-how required. Maybe you've got an older relative who wants nothing to do with smartphones. Or maybe you just hate messing around with apps, figuring out how to turn on voice commands and spoken directions. Unlike smartphone apps, car GPS units are truly plug-and-play. Bottom line: The experts at Wirecutter say that "the best GPS devices can still make it easier to navigate to your destination," but add that, "For day-to-day navigation, however, a smartphone can work well for most people, especially if you have a car charger and a car mount to keep it where you can easily see it." If you've decided that a stand-alone auto GPS is right for you, it's no contest, experts and owners say: Garmin auto GPS is simply the best. 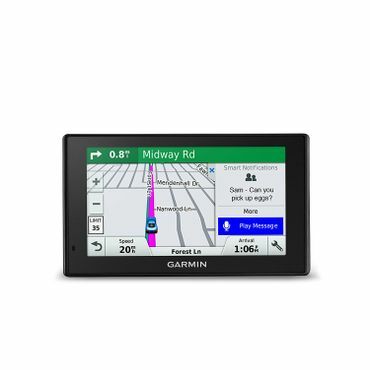 Consumer Reports is no longer testing GPS units, but in their last review, all but one of the eight recommended models were Garmins (a Magellan navigator squeaks into seventh place among GPS units with larger screens). Wirecutter does still test GPS systems, and Garmin GPS models again nearly sweep the awards (a cheap TomTom unit is the budget pick). Our research indicates that for most drivers, the Garmin DriveSmart 51 LMT-S (Est. $200) offers the best combination of features and performance. Wirecutter recommends it for anyone who has an extra $80 to spend over the entry-level Garmin Drive 51 (Est. $150) (discussed below). The DriveSmart 51 LMT-S includes all of the features most people want -- a 5-inch color multi-touch screen, free map updates for the life of the unit, voice commands (so you don't have to type) and Bluetooth (so the Garmin can pair with your smartphone; you can receive calls, texts and calendar reminders via the unit). Built-in Wi-Fi allows easy map and software updates. The unit also includes Garmin's DriveSmart features: warnings for sharp curves, speed changes, railroad and animal crossings, school zones, wrong-way driving on a one-way street, and driver fatigue (this warning kicks in when you've been driving a long time without stopping). "While road-testing the DriveSmart 51 LMT-S, we found these extra features worth the extra money," Wirecutter says. There are two options for traffic data. The 51-LMT-S is compatible with Garmin Live Traffic, which is delivered via the Garmin Smartphone Link (Free), an app available in both the Google Play and Apple App Store. Other pluses include weather updates and even parking prices and availability trends for on-street parking -- a real plus in busy cities. The app is free to download and use, though a few features, such as access to live traffic camera feeds, require a one-time fee to access. The other option is Garmin's more basic Garmin Traffic service. It's a free service, and uses no wireless data so a smartphone isn't required, but Garmin has removed the formerly built-in receiver for that from its latest models. That means that those that want use Garmin Traffic instead of Garmin Traffic Live will need to buy the Garmin GTM 36 Traffic Receiver (Est. $70). The GTM 36, which also includes a car power cord, has been on the market for several years as a "fix" for otherwise functional Garmin GPS models with traffic receivers that had ceased to work and has relatively good user feedback for its performance. It's a one-time purchase, with no fees or subscription required. But, as Wirecutter notes, using Garmin Live Traffic does offer some significant advantages. Traffic information delivered through Smartphone Link covers a wider area than that delivered through Garmin Traffic, though neither is as comprehensive as what you'll find using some smartphone apps, such as Google Maps or Waze. In addition, Garmin Live Traffic information via the app updates every minute, while the more basic Garmin Traffic service updates every five minutes. You also miss out on some of the other goodies, such as parking information. Owners mostly like the DriveSmart 51 LTM-S – but when they complain, it's often because they're surprised that the advertised "lifetime traffic" isn't actually baked into the unit (as it was on earlier Garmins). Some don't have a smartphone, or don't particularly want to waste their smartphone's data and battery on traffic info, or resent having to buy an extra $70 cord if they want to avoid using a smartphone with the unit. Some owners say once they do pair their smartphone with the Garmin, it will randomly drop the connection (severing their traffic info), or that the Garmin "grabs" all phone calls and flashes every email notification they get all over the navigation screen. Several owners also complain about buggy units, or that the Garmin makes lousy route choices. Still, happy owners well outnumber unhappy ones, and the DriveSmart 51 LTM-S earns a 4.3 star score at Best Buy based on around 425 user reviews. Need a backup camera? Like all other Garmin units in the "Drive" series, the DriveSmart 51 LMT-S can also pair with the Garmin BC 30 Wireless Backup Camera (Est. $155). If you need or want a bigger screen, the Garmin DriveSmart 61 LMT-S (Est. $250) car GPS is pretty much the DriveSmart 51 LMT-S with a 6.95-inch, higher-resolution touch screen. That's almost as big as an iPad mini -- and it really is easier to see at a glance than the 51 LMT-S, reviews say, especially if you've got bad eyesight or a big vehicle. Users generally like the DriveSmart 61 LMT-S: They award it 4.6 out of 5 stars at Best Buy, for example, based on nearly 1,300 reviews. Complaints mirror the smaller DriveSmart 51's – buggy software, bad routing, and the extra gear required to get traffic info. 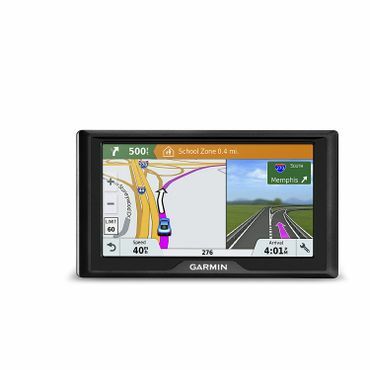 Garmin offers two more high-end traditional auto GPS models. The Garmin DriveLuxe 51 LMT-S (Est. $330) builds on the DriveSmart 51 LMT-S, adding a slimmer design, higher-resolution multi-touch screen and powered mount. However, Wirecutter thinks that the Garmin DriveAssist 51 LMT-S (Est. $300) is a more compelling upgrade pick. It skips the DriveLuxe's goodies in favor of a built-in dash cam that continuously videotapes your drive (providing valuable evidence in case of a crash) and provides camera-assisted driving help, such as forward collision and lane departure warnings. "These active safety features are becoming common in new cars, and the DriveAssist offers an easy, affordable way to add them to an older or more basic car," Wirecutter says. In addition, like the other Garmin "Drive" series units, it's compatible with Garmin's wireless back up camera. Like the other Garmin "Drive" models, owners give both of these upscale versions mostly good reviews – with the same complaints as the cheaper versions. If you can do without some of the niceties in the GPS models profiled above, the Garmin Drive 51 LMT-S (Est. $150) is a great lower-priced option. It includes most of the features found in Garmin's more upscale models, including Garmin Live Traffic compatibility. Fans include Wirecutter, which names it the best car GPS (on the basis of performance and value) in its latest update. "The Drive 51 LMT-S is the least expensive Garmin model we tested, but it has a clear 5-inch screen and all of the essential features we expect in a good GPS device, without the extras that many people can do without," Eric Adams and Rik Paul say. You do give up a few features, however. The Drive 51 LMT-S lacks voice commands, for example, and the touch screen is not multi-touch, so you can't pinch to zoom in. The GPS system is a little less sophisticated, as well -- you can only program 100 waypoints versus the 1,000 waypoints you can program into the DriveSmart 51 LMT-S -- though it is otherwise just as functional and reliable. The Drive 51 LMT-S is compatible with a wireless back up camera, such as the Gamin BC 30, and if you want to skip using Garmin Smartphone Link and a smartphone for traffic data, it's compatible with the Garmin GTM 36 Traffic Receiver, too. If you don't care about traffic at all, you can save a little bit more by opting for the Garmin Drive 51 LM (Est. $120). This very basic GPS unit has the same core functionality as pricier models. It boasts the same, bright, easy-to-use, 5-inch touch screen, and the same impeccable navigation. It speaks directions using landmarks, and it issues all of Garmin's driver warnings (sharp curves, driver fatigue, school zones, etc.) It has lane assist to guide you into the correct lane for an upcoming turn, and you can hook it up to Garmin's optional backup camera. However, while lifetime map updates are free, there's no way to add traffic data, and the unit is not compatible with the GTM 36. Want Amazon Alexa for your co-pilot? The Garmin Speak (Est. $150) and Garmin Speak Plus (Est. $230) (which adds a dash cam) have Alexa baked right in. You'll be able to navigate and chat with Alexa at the same time. However, these Garmins require a smartphone with a data plan to work – and they don't look like any GPS device you've ever seen. For one thing, there's no map screen. The Speak looks exactly like a tiny black Amazon Echo Dot stuck to your windshield. You say, "Alexa, ask Garmin to find (blank)," and the Speak responds with spoken turn-by-turn directions. Visual cues? Well, you get a light-up arrow and a distance number (e.g., left arrow, 0.5 miles). That's it. No street name. If you hardly ever glance at your GPS's map while you're driving, no problem, testers say – the spoken directions do include street names, and they're clear and easy to follow. But others find the lack of a map unnerving. "We want our screen back," says Digital Trends' Terry Walsh, echoing the sentiments of owners who say they tried the Garmin Speak but quickly reverted back to Google Maps on their phones. True, a tiny map does pop up on your phone while you're en route, "but it doesn't show your location on the map," PCMag's John R. Delaney points out. The Garmin Speak comes with a magnetic mount and power cable; the dash cam-equipped Speak Plus also comes with a microSD card to record footage. Unlike other Garmin models, the Speak models won't work with Garmin's backup camera. While using your smartphone data is optional with other Garmins (save for the models that lack traffic capabilities altogether), the Garmin Speak requires your smartphone's data connection to work. The more Speak functions you use (streaming music from Amazon or Pandora, navigation, etc. ), the more of your phone's data you'll gobble up. The Garmin Speak and Speak Plus work fine in expert tests, but at the same time, reviewers wonder if they are necessary. Free smartphone apps already let you navigate (with spoken turn-by-turn directions) and chat with Alexa anytime you want. "Whether you need a dedicated, $150 microphone hooked up to your smartphone to perform these tasks, I'm not so sure," Walsh says. Walsh gives the Garmin Speak a mediocre 2.5 out of 5 stars. PCMag's Delaney gives it 3.5 out of 5 stars. Owner reviews are unenthusiastic: More than one in four Amazon reviewers slaps the Speak and Speak Plus with the lowest possible 1-star rating. The most common complaints? The Garmin units drop their connections or won't respond to commands, owners say. Among credible experts, only Wirecutter has, to date, reviewed a number of the latest GPS models, including the Amazon Alexa-enabled Garmin Speak models. Its test is comprehensive, including driving over 1,200 miles of roads of all types. PCMag and Digital Trends also publish thorough tests of the Garmin Speak. Otherwise, we looked to reviews of earlier generation GPS systems, which are helpful as those are very similar to the latest models. Consumer Reports no longer tests GPS units, but its last review as well as a buying guide remains on line. We also studied owner-written reviews at Amazon and Best Buy; real-world users can judge signal strength, navigation prowess and long-term reliability in ways that even the most hard-core expert test can't.